My wife is a big fan of the Dana Gould Podcast. Occasionally I listen to it with her, and it is indeed a very entertaining podcast. If you don’t know who Dana is, well, click here. On this week’s podcast (Ep.4 Apocalicious), Dana and his cohorts discuss various aspects of apocalyptic films, in particular the Omega Man and Planet of the Apes, both starring Charlton Heston. I share this admiration for these films, in particular Planet of the Apes. Great movie. Some great social commentary on the film. My introduction to the Planet of the Apes films occurred in 1973, when I was in the 3rd grade, when the final film of the series was released — the great Battle for the Planet of the Apes. OK, sure, it didn’t have all the great metaphorical stuff that the original film had, but it did have an army of apes fighting an army of human mutants. For a 3rd grader, that was pretty awesome. In the coming years I would see all of the Apes films on TV during “Ape Week” on channel 8’s afternoon movie, and become somewhat of an expert on the details of the series, including the confusing paradox related to time travel. I was the proud owner of the General Ursus model kit, built and painted with the patience of an Orangutan scholar. My mom dropped me and a friend off at the theater to see the film, and it was glorious. In the days following my viewing of the film I have a vivid memory of telling a friend of mine from down the street all about it. I mean, I was stoked, and wanted to share this experience. C’mon! We’re talking APES with guns and underground mutants! And we’re talking TALKING apes! This kid came from a very religious family. I won’t mention the denomination, but I will say it was one of those sects in which they go to church every time the doors are open, which seems to be nearly all the time. Now, I didn’t grow up in a family of heathens, but damn, my parents worked! We went to church for an hour on Sunday morning, and that was it! Combining that hour with the time needed to get dressed in all our finery as well as travel time, and you’re looking at nearly three hours of precious weekend. So an hour was all the Lord got from us. Sorry, Jesus, but we have stuff to do. Plus, the game is coming on — gotta get home fast. I was telling this kid — we’ll call him Richard — about the movie. He informed me that his parents wouldn’t let him see those movies because the films said that “people came from apes”. Thinking back now, I realize that even at that age my own world view had begun taking shape. I had a set of World Book and Child Craft books. I was totally into science. My mom was a highschool math teacher and my dad was a junior high science teacher and coach. I was already aware in a very rudimentary way of evolutionary theory. I remember realizing, right then and there, that I was smarter than Richard’s parents. For the first time, I had run into the wall of ignorance and stupidity that religious fanaticism can create. Yes, just to be clear, I’m saying that if you think the creation story of the Bible (or any of the other creation myths from the world’s religions) is the literal truth, you are stupid. Sorry, the truth hurts. Smart religious people don’t put so much stock in myths like this. They find ways to still believe their religion while not ignoring science. Most, I think, compartmentalize the two competing world views, which I find a bit psychotic at best and intellectually weak and dishonest at worst. The ones who are both smart and honest discard their religion, or become deists or something similarly vague. I’m not saying that Richards’s parents(or you) are a bad people. No, they were very good people. But not the smartest. This realization, however, extended beyond a simple disagreement over human origins. You see, I was suddenly enlightened that a great many adults were probably wrong about a great many things, and I would have to use my own mind to figure out who the idiots were. I told my mom about the incident, and I remember her essentially just saying “They’re stupid, don’t listen to them”. Hahahahahaha. Of course she didn’t use those exact words, but her meaning was clear. But she really didn’t have to tell me. I had already come to the same conclusion. 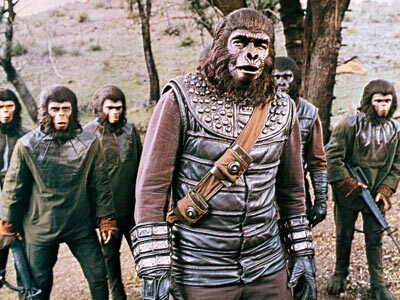 Religious fanaticism depicted in the original Planet of the Apes — sadly by the head scientists. Must be Republicans. Thank you, my friend. When I was writing it, at several points I asked myself “How would Mike phrase this?”.